An inline CO2 sensor has been developed that is maintenance free and can accurately measure carbon dioxide concentrations in beverages. Carbo 520 Optical is a new process CO2 sensor for beverages easily installed directly inline. The robust, hygienic sensor is entirely maintenance-free and provides linear, drift-free CO2 readings over the entire measurement range. The basis of this breakthrough is an optical measuring principle called ATR. Carbonation is a key element to the taste and perceived freshness of a beverage. 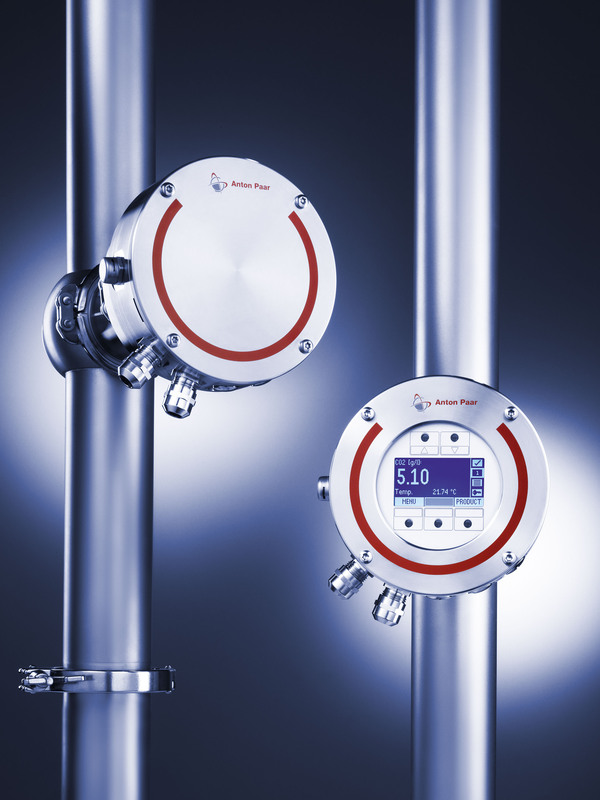 For complete control of this parameter in production, where beverage producers naturally seek to minimise their raw material investment and run their production tightly within specifications, the concentration of dissolved CO2 is ideally measured continuously and directly inline. However, the path to precise CO2 results is not without obstacles: Potential “pitfalls” that may falsify results include the influence of foreign gases like oxygen or nitrogen, as well as beverages’ individual colour, turbidity, solubility and sugar composition. While a sensor must be “sensitive” to these issues, there is still no room for weakness: Process conditions are rough and can easily lead to wear, tear and malfunctions if the chosen sensor is not up to the job. This is where Carbo 520 Optical comes in: The inline CO2 sensor from Anton Paar is entirely maintenance-free, hygienic and robust – easily installed directly inline and in constant contact with the processed sample. Carbo 520 Optical measures CO2 concentration based on the spectroscopic approach of Attenuated Total Reflection (ATR), so the only “motion” in the system is the passing of infrared light through a crystal. Since the sensor has no moving or mechanical parts, there is no wear and tear and no disposables are required. Another essential benefit of the sensor’s optical measuring principle is that users can count on uninfluenced CO2 results. Since the sensor measures specific wavelengths of light absorbed by CO2 molecules only, the measurement is highly selective and not affected by other gases in the sample. Also, since the measurement is performed at the surface layer of a sample, its individual colour or turbidity is irrelevant to the measured results. In addition, Carbo 520 Optical’s results are independent of the measured beverages’ solubility and sugar composition. This means that users can apply the exact same measurement method whether they wish to determine the CO2 content of colas, beers, wines or other beverages. No beverage type differences need to be considered. These characteristics together with the system’s high measurement speed and energy efficiency considerably reduce operating costs and ensure smooth production runs. For intelligent operation in any position that best serves the operator, different versions of Carbo 520 Optical are available: It can be combined with an mPDS 5 evaluation unit, an operating terminal or a remote operating terminal placed up to 250 meters away from the sensor. Carbo 520 Optical is a truly “fit-and-forget” system that provides linear, drift-free CO2 readings over the entire measurement range from 0 g/L to 12 g/L – and gives way to a new kind of certainty in CO2 monitoring throughout the beverage production process.